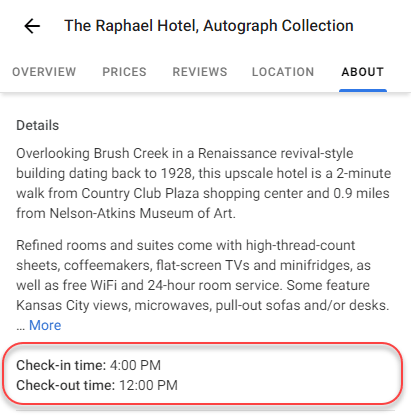 Google announced that hotels can now add their check-in and check-out times to their Google Local, Google Maps and Google Hotel listings. Brad Brewer shared a screen shot of one listing that already has theirs listed. (1) Sign in to Google My Business. (2) If you have multiple locations, open the location you'd like to manage. (3) From the menu, click Info. (4) In the check-in and check-out times section, click the pencil icon. (5) Enter your check-in and check-out times.